'The Devil's Violinist' with David Garrett as Paganini, Comes to the U.S.
Well, the critics are not being kind so far to David Garrett in "The Devil's Violinist," the story of Niccolo Paganini, written and directed by Bernard Rose and just released last weekend in the U.S. Yet the reviews are kind of a gas...here is a link to a bunch. Has anyone seen it yet? I think I just may have to. It appears to have the potential to be a camp classic. Be warned, it's "Rated R for sporadic opium huffing and serial fornication..."
Yes, I watched it! The storyline is okay, but David Garrett's performance on the violin is great to watch. He tried to be as authentic with his violin and the orchestra too (I.e. gut string, no shoulder rest, no chin rest,etc). The soundtrack and his arrangements of pieces are great too. Is that like making love in a bath full of cornflakes? Kornflakes, Buri. Get it right. Just saw this last night. It was interesting. I wouldn't call it a movie one actually cares about but was alright. The movie did not leave any lasting impressions or trauma at least. David Garrett didn't have many lines and was a bit thankful for that. Have never liked his playing but for this movie it worked in an amusing silly way. There was random huffing of some device that was never made clear and it showed up quite abruptly. They did make Paganini to be a bit of a, how to say... promiscuous douche. Only recall one scene at the beginning with a scantily clad lady in bed with him. No headlights shown or anything. Darn. What does one go to the movies to see? It's probably not a movie I'd go out of my way to see on this side of the Pond, but based on the trailer it may conceivably inspire some to take up the violin - until the reality of playing the Devil's instrument becomes apparent! But a chosen few may yet stay the course. My comment is as follows: I attended the promo for Devil,s Violinist in NYC this past SundayFeb.1,2015. I so enjoyed the movie. I read the biography of Nicoli Paginni.David,s portrail was very acturate.David,s life does not follow same path .But David is a marvel of the violin.I have followed violin music for a lifetime.I must give accolades to David Garrett for his talent on the violin.He is a gifted Violinist. I truly think God gave David talent that noone before or since will possess. He his Heavenly to listen to. I traveled 3892 miles to watch David in concert in Monterrey ,Mexico Nov.22,14. I would do it again in a heartbeat.I traveled more than a few miles to NYC to watch the promo of Devil, Violinist. I was honored and priveledged to meet David, talk with him,he signed my cd and my pic with him.David is a humble, grounded man. He is a gentle man and a gentleman.I am forever grateful for David sharing his music . Danke schon David Garrett. I watched the movie - twice - this weekend, and I did so to watch and hear David Garrett perform. After watching, I did a bit of web browsing to learn more about Paganini, and based on what I found, the movie seems to capture common elements of what is reported about his life. 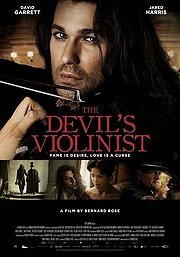 Prior to viewing "The Devil's Violinist", I'd never heard of David Garrett. I think he is an impressive performer, and perhaps, as was Paganini, he is not a typical soloist insofar as he diverges from a traditional performance track. During the movie, the concert scene in London reminds me of when The Beatles arrived in the U.S.A. Between the swooning young ladies and the protesters concerned about virtue, Paganini was portrayed in the 19th century as The Beatles were received in the 20th. Probably adding to this interpretation were the sun-glasses. Larger than John Lennon's, Garrett's shades were more like Ozzy Osbourne's.